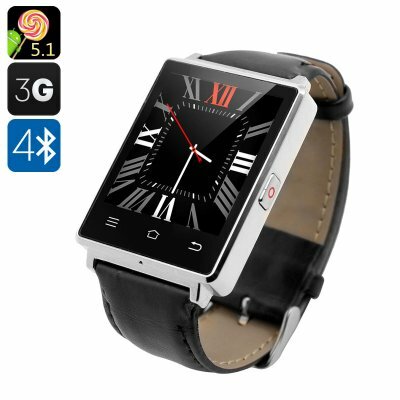 Successfully Added NO.1 D6 3G Smart Watch - 1.63 Inch Display, Android 5.1, Bluetooth 4.0, GPS, Wi-Fi, Heart Rate, Pedometer (Silver) to your Shopping Cart. The NO.1 D6 3G Smart watch comes with 3G connectivity, Bluetooth 4.0, Wi-Fi support, a nice stylish design, Android 5,1 operating system, a heart rate monitor, a pedometer, a barometer and more. Android 5.1 offers a convenient interface and easy navigation. Despite the smart watch's compact 1.63 inch IPS display, it's easy to operate and you will see all the needed icons clearly displayed on the screen. You can pair the 3G cell phone watch to your smartphone: Android and iOS and unlock more features by simply downloading the Watch Helper app from the App Store or Play Store. The NO.1 D6 is a great outdoor companion. The watch phone comes with a pedometer that will help you track physical activity throughout the day, a barometer to predict weather changes — a great feature to have on board for hiking and camping trips, a heart rate monitor for keeping an eye on your health and more. The MTK6580 Quad Core CPU and Mali-400 MP GPU ensure smooth operation and the built-in battery offers up to 4 hours of continuous talk time and 24 hours on standby.